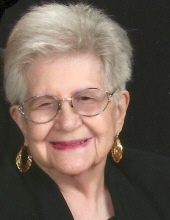 Margaret "Peggy" Kitch, 94, of Palmyra, MO, formerly of Taylor, MO, passed away at 1:20 PM Monday, January 28, 2019 at Blessing Hospital in Quincy, IL. Graveside Services and burial will be at 12:30 PM Monday, February 4, 2019 at the Steffenville Cemetery in Steffenville, MO. Deacon Bob Leake will officiate. Friends and family are invited to Peggy's Life Celebration at a visitation that will be held from 10:00 AM - 11:00 AM Monday, February 4, 2019 at the Lewis Brothers Funeral Chapel in Palmyra, MO. A short prayer service will be held at 11:00 AM. Peggy was born December 28, 1924, in Readville, Mass. to Pasquale and Rose Viscardi Tufo. She was married to Harlin W. Kitch on September 1, 1945 in Readville, MA. He preceded her in death March 28, 2013. Survivors include two children, Harla Friesz (Jim) of Palmyra, MO and John Kitch of Hannibal, MO; six grandchildren, Tom Barnes, Chris Wellman, Candi Buckman (Bob), Jaime Gard (Dan), Dusty Friesz (Ashlee), and Jessica Friesz; 12 great grandchildren; four great great grandchildren; and one great great great grandchild. Peggy was preceded in death by her parents, one daughter, Sandra Newbold, one son, Richard Kitch, two sisters, Josephine DeNapoli and Jennie Forbes, and one brother, Charles Tufo. Peggy was born at home on December 27 during a snowstorm. The doctor was unable to reach the home until December 28 so that is the date listed on her birth certificate. Professionally, Peggy worked as a waitress for 25 years at the Mississippi Grill in West Quincy, MO. A selfless person, Peggy also volunteered her time at the LaGrange Nutrition Center for many years. Peggy was proud of her heritage and loved cooking Italian meals for her family. She enjoyed playing Bingo, shopping, and dancing. Most of all, Peggy cherished the time she spent with her family. Peggy attended the St. Joseph Catholic Church in Palmyra, MO. Memorial contributions may be made to the Flower Children Cancer Fund. Pallbearers will be Will Wilburn, Bob Buckman, Dan Gard, David Kitch, Mike Kitch, and Brian Caldwell. Honorary pallbearer will be Master at Arms Petty Officer Second Class - Shelby Wellman. To send flowers or a remembrance gift to the family of Margaret "Peggy" Kitch, please visit our Tribute Store. "Email Address" would like to share the life celebration of Margaret "Peggy" Kitch. Click on the "link" to go to share a favorite memory or leave a condolence message for the family.